Death. Look at that word. Say it out loud. There is nothing happy about the word. It is gray, dark, sad, and hopeless. It is unflinching and unyielding. It makes no apologies. It is the point of no return. It is the end of the road. On May 2, 2012, Junior Seau took a gun and shot himself in the chest. He chose to end his life. I suspect many of you do not know Junior Seau. He was a football player in the NFL. He played for the San Diego Chargers, Miami Dolphins, and the New England Patriots. Within a week of him taking his life, we all moved on to the next thing. Today’s world lives at the speed of the Internet. News has no shelf life anymore. We replace yesterday’s noise with today’s stories. The important things from last week are a vague memory today. Unless you were married to Junior Seau or if you were his father, mother, sibling, or close friend, what he did is water cooler chatter or a Facebook update. Isn’t it odd how we can hear of a person’s suicide, file it as a temporary sadness in our short-term memory, and quickly move on to the next thing? How many news events can you recall from six months ago? They came. They went. There is no paper trail or emotional connection to those things that were worthy of news back then. Today’s words has shouted down the sounds from yesterday. Unless, of course, it was your relative who took his life. Unless it was your son, daughter, or spouse. My brother did not take his life, but his wife did. She decided to do something similar to what Junior did, but instead of turning it on herself, she killed him. What she did connects my mind to a moment that will never go away. I can’t tell you what happened three months ago, but I can tell you what happened on a dark Friday night in April 1997. Mable is similar. Her son took his life. He pulled out his gun and shot himself in the head. He died, leaving his mom standing at the end of the road, alone. She will never forget that day. Time has frozen that event inside her mind. She cannot cover it up with a better day–when there was life, family, and happiness. There is no future day–on earth–where she can embrace her son. He left her standing at the end of the road, alone. His death is like a giant unmovable boulder. All other events are like the wind that swirls around her boulder and then vanishes. Mable lives with one indelible memory of what could have been. Nobody notices it, but she cannot help but see it. Sometimes she feels like a compelled amputee who reaches to scratch her leg. She leans forward to scratch only to recall that she is not an amputee. Part of Mable “died” with her son, which is why part of the torment is her phantom itch. Her mind tries to wrap itself around what happened. There are so many questions, but all the answers went with her son to his grave. She searches in vain for what nobody can fully answer. The best explanation is that it was a sin that put her son in the cemetery. Suicide, like anything else outside of God’s moral will, is a sin. He was selfish. He was not thinking about what he was leaving behind. At least those thoughts were not more controlling than his awareness about what he wanted to do to himself. At some point, I would want to let Mable know that it was sin. I would not tell her initially because her grief is tremendous and she needs to cry. She is not ready for that kind of biblical honesty. In time, the numbness will wear off, and there will be many thoughts that will fight for control of her mind. That time is when someone must stabilize her by the Words of God. As to the “why question,” the most biblical answer is that her son was self-centered. It does not make his actions right, but sin is never right. She will need to come to terms with the doctrine of sin as it pertains to her son. If not, she will experience ongoing guilt, shame, fear, anger, hopelessness, and even loss of faith in God. She will look for answers that will never come. She will wrestle with a mystery that is too great for her to unravel. The only thing that will make any biblical sense at all and no matter how sad it may sound to her lonely ears, her son chose to sin. It was a volitional reaction that he was responsible for making. Mable did not cause her son to kill himself. Competing and unbiblical desires became cancerous until they turned on him. This process is not a hard thing to understand unless it is your son. Unless you were the one left standing at the end of the road, alone. It is in this seemingly impossible moment where I would want Mable to know that Christ and His grace is more significant than all our sin–even her son’s. She will come to understand these things in time when the grace of God displaces the pain in her soul. Today, she will have to make a choice. She will have to choose to let her son go. She must give up the “would’ve, should’ve, could’ve” for the grace of God. There comes the inevitiable when we are called to let something go while grabbing onto something else. It is not unusual for a person like Mable to not want to let go of the grief she carries for her son because to let go is the closing curtain call. It’s the final bow. It’s the last admission that life as she has known it is no more. Grief can become a person’s way of keeping something alive. To move on is to acknowledge he is dead–that it is over. I’ve seen cases where the one left behind can feel a sense of guilt if they let the dead person go. By holding on to the grief, the survivor has a sense of extending his life. It is make-believe, but it is all she has. For now, it is her salvation. The process of letting him go continues indefinitely. It’s a psychological way of not allowing him to go, a “thought warfare.” Grief becomes their way of coping. In their mind, to move on is to say it is over and they are not ready to say it is over. They can’t say it is over, especially for a son who has not lived his expected allotment of years. A person like Mable could talk herself into feeling guilty if she let her son go. She was not prepared to say goodbye to her son, and she refuses to say goodbye now. Isn’t this why we put flowers on the graves of those we love? What are we doing? We are remembering. It is our way of staying connected to the dead. If they died of natural causes, it would be easier to let them go. We would grieve for a season and put it past us. Premature death is another animal. They were not supposed to go this way, and we were not prepared to let them. Grief is the coupler that connects the living with the dead. This tension reminds me of the death scene of Jack in the movie Titanic. Rose and Jack were floating in the cold icy waters of the North Atlantic. Within minutes, Jack died of hypothermia. Rose did not want to let him go. Eventually, she did the impossible, and the next scene shows Jack sinking to the bottom of the Atlantic. There is a grief that cannot be spoken. Mable needs a friend to cry with her. She needs a friend to walk with her through the shadow of the valley of death. Understand the Dividing Nature Of Sin – She will have to come to terms with sin and what sin does. She will not get all the answers to her questions, and even if someone could thoroughly explain everything to her, it would not satisfy. Her son chose to sin. It’s cold. It’s hard. It’s the only truth that explains what happened and why it happened. It would not serve her soul to go beyond biblical revelations. Sin has torn her soul; that is what sin does. Like a tornado ripping through a town, Mable has been ripped apart by the evil of another. Guard Her Heart Against Sin – She may be tempted to blame herself in some way. She is not responsible for anyone’s sin, other than her own. Her son chose the wrong thing, and he will have to stand before God for his actions. She will not stand before God for his actions. If she has sinned against her son in some way, she will need to rest in the cleansing promises of God. We confess our sin(s) to God and live in the freedom He offers us. We can do this because of the gospel. Celebrate What You Had Together – Her son may be gone, but the memories are hers to celebrate. I share many stories about my brother with my children. We laugh a lot, especially about the time he rode his bicycle into the barn and landed in front of a bull. We all have stories. Mable will have to remember her son that way. Mable can celebrate what she had, not what she wishes she had. If she does not do this, her grief will eventually turn to bitterness and anger toward God. Her pain will strain her relationships with her friends. God does not reveal everything to us, and He is not obligated to disclose His full mind on everything. One of the reasons He does not tell us everything is because He wants us to rest in Him and not the facts of a situation. Believe God Will Wipe Away Your Tears – One of the most amazing things about the Word of God is the assurance we get from Him that He will wipe away all of our tears and sorrows. I have no idea how He is going to do this, but I believe Him. It has been this act of forward-looking, thinking, and living that has helped me through my grief. When I look backward at what has happened, I shake my head in maddening disbelief. When I look forward, my heart begins to change. My faith receives a boost. It’s a fantastic thing: God is going to make all things right. I do not understand the intricacies of this truth, but I choose to trust Him. 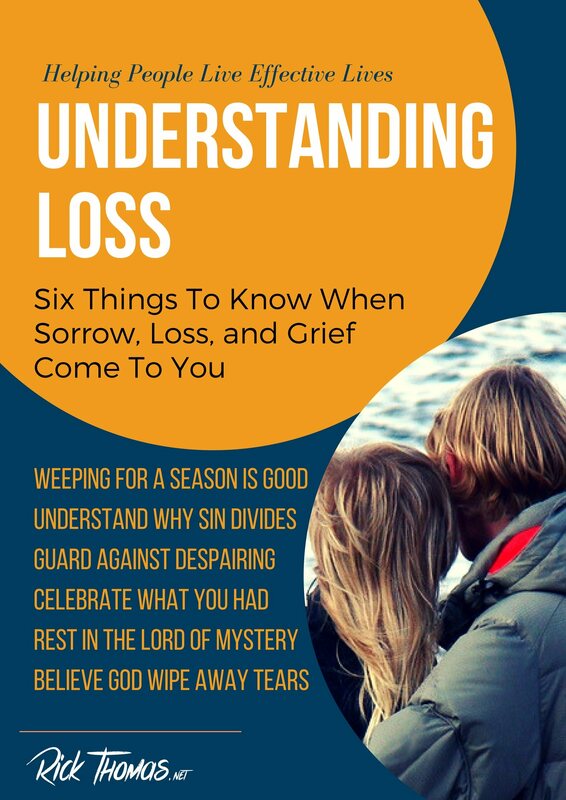 What kind of sorrow are you experiencing? Perhaps it’s not the suicide of a close friend or relative. Maybe your sadness is of another color. Regardless, it’s sad, hard, and challenging to you. Will you take some time to reflect upon these questions? 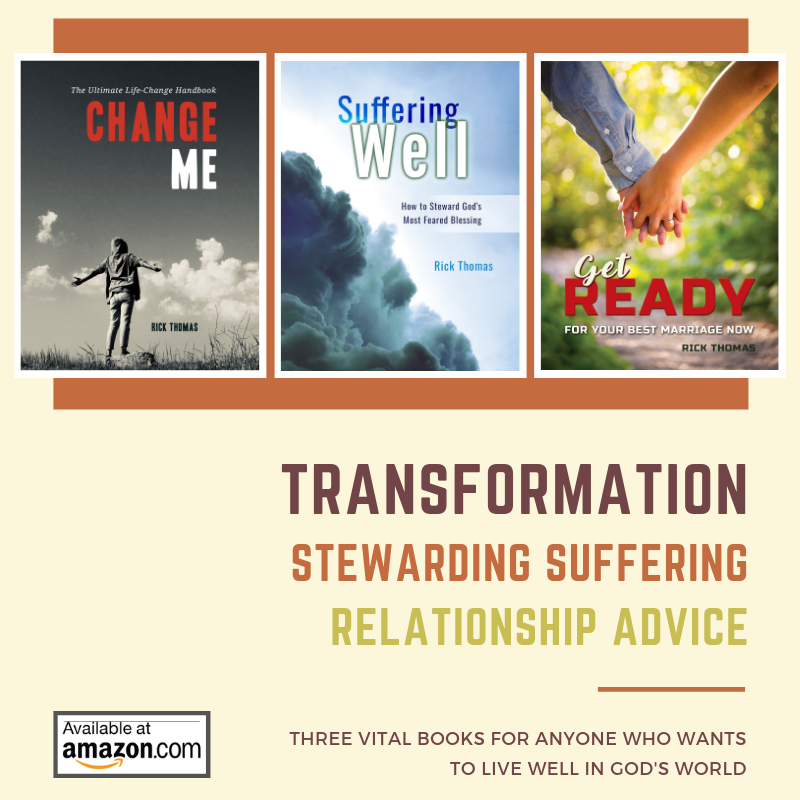 Is the grace of God practically more sustaining to you than the sorrow you’re experiencing? If not, why not? Are their things you are doing that keeps you connected to your loss in an unhealthy way? Would you talk to one caring and courageous friend about this, someone who will speak the truth in love? Are you engaging others so you may benefit from their care, as imperfect as it may be to you? Or are you choosing to pull away from the community of faith? « Are You a Tomb Dweller or a Resurrected Christian?